A recent Stuff article revealed that Facebook is testing ‘highlighted listings’ – much like the ones you can pay for on Trade Me to make your ad stand out. 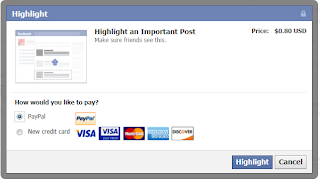 This new feature is only at beta phase at the moment – a NZ Facebook user stumbled across it last week, when a pop-up asked him if he would like to highlight his post for US $2. 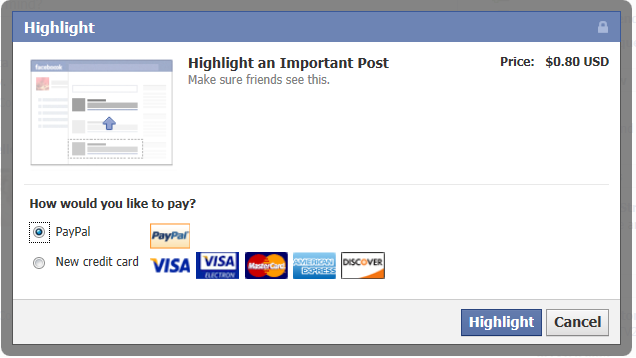 Facebook has confirmed this is a feature they are testing to gauge people’s interest. A RéserveGroup staff member also saw the pop-up last week – but it offered to highlight her first post for free, and then asked for 80c to highlight the next listing. If this becomes standard practice it would of course be rolled out to business pages. With the amount of content that goes through a typical Facebook news feed in a day, we could soon be seeing more highlighted posts than anything else. Think Trade Me when you search on any main category – all of the yellow listings are ‘featured listings’ that people pay more for to make their item ‘stand out.’ The problem is, when everyone starts doing it, highlighted posts just get lost in the noise. I enjoyed a lot by reading your blog post. It is worth reading your whole article. I believe that placing comments on others blog post is good. It helps the blog owner to do more posts. There is some businesses sell more than one item in a day. If one has more than one product to advertise, then you can accept more challenges. How to highlight your products? Which method you can use for advertising? How easy to advertise right product to the right people? Is there any easy way you can follow it. Did you know more about it? When I accidentally visited this site, I thought it is boring but it is very interesting one. In recent years, advertising a products need much concentration. A product ad helps businesses to promote multiple products. A product ad will reach across all the devices their customers use. You can showcase your products with help of product ads. If you are using facebook then once search for more relevant product. The Product ads focus mainly on businesses. With this one can advertise any type of products. 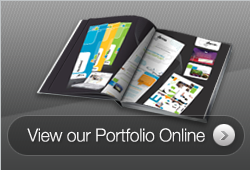 If you are the owner or leading a business can upload their product catalog. If you want you can also create campaigns. These can help you target a person. Also it is also target audience to introduce a product. You can customize the product ads for better performance. One can also travel throughout the customer journey. If you use product ads it can help people to view the product at right place. I am very much thankful to you for the amazing idea of product ads. Hearty felt thanks for you. If you use product ads you can see how Facebook and Instagram ads working. After reading each and every point in your article, I have satisfied a lot. Go through with my site: Cheap essay writing service and share your reviews. It's a pretty interesting feature. Check this https://paperovernight.com/blog/philosophy-paper webpage and we will discuss it. I am happy to hear that news. It means that advertisement of my company papers-land.com will be quality. I am ready to pay even more if it will gife an effect. Anyway, facebook is a great platform for launching a personal business. The challenges faced by modern student are the absence of knowledge that is required in doing any kind of writing. Here is a helping hand with your studying.